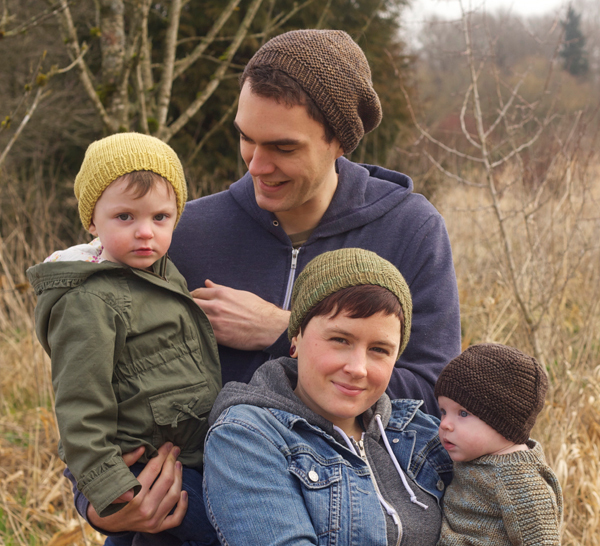 My fake knitting family in matching Barley hats. My brother Jordan, his lady Emily, and my 2 wee ones Hunter and Jones. Is there anything cuter than a family in matching hats? 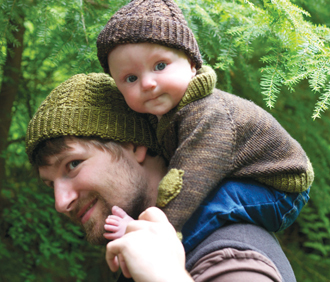 Ok, maybe a family in matching sweaters – but who has the knitting stamina for that?! Not even me, so I’m left with adorable matching hats. What I love about hats is that everyone wears them. From my picky hubby (who has a couple of hats as his entire knitted-by-me wardrobe) to my ‘I don’t want to wear anything. Ever.’ nudist children – when the weather turns, they all wear hats. BARLEY ::: simple, modern unisex, and it’s even FREE!! Adorable on boys or girls, from baby to big! 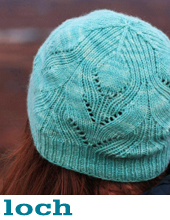 The Barley hat (a free pattern part of The Simple Collection, our learn-to-knit series) was released in July and has been an instant hit. Knitters have been whipping them up in every colour and fiber and often more than one (I hear they are a little addictive). There are over 4400 projects on Ravelry! 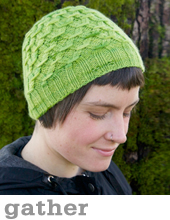 This hat that suits just about everyone and has a simplicity that shows off any pretty skein of yarn. As you can see from my model family, it works for everyone! Sized from Baby to Adult Large and everything in between you can get a few of these done in no time. Intimidated by knitting in the round? 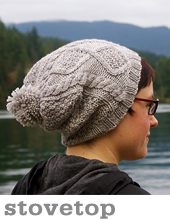 Check out our in-depth tutorial on how to knit the Barley Hat, and get started today! 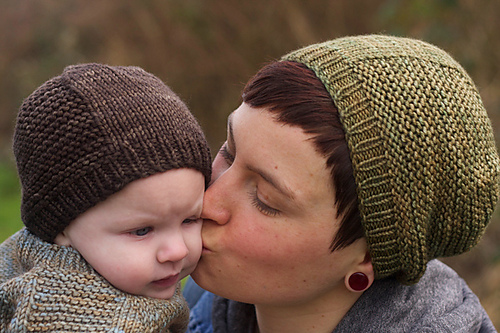 The Hunter hat is one of the first patterns we sized from baby to big. This pattern and our Lumberjack socks (both from 9 Months of Knitting) launched us on the path to 17 size sweaters, 5 size hats, and 6 size socks. All for the love of a father-daugher photo! There is just nothing more adorable and heart melting to Emily and I than cute Dads and their cute kids. This is my hubby and my daughter Hunter in the woods in Stanley park. They are the best of friends and it shows in her shining eyes. The Hunter hat is sized for all and looks great on Mommy too! If it’s your first time trying cables, they are EASY (we promise) – check out our tutorial here. 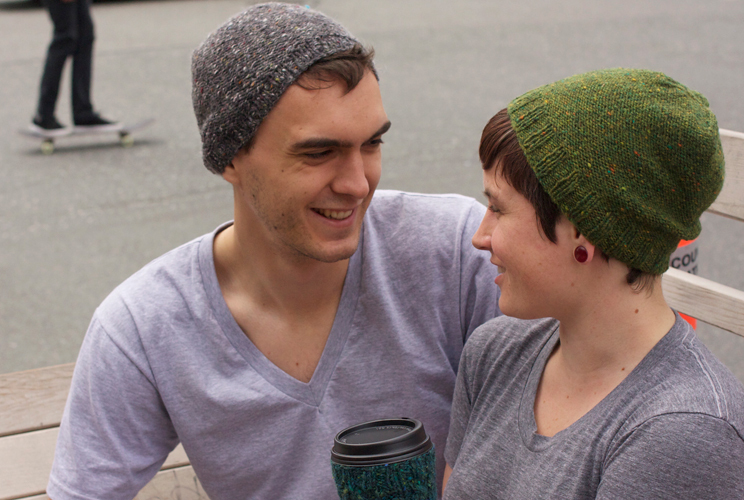 HIPSTER ::: perfectly understated, for the hard-to-knit-for folk you love! I don’t know about other cities, but Vancouver has a lot of hipsters. I love them and at least partially count myself among them. I mean, I design knitwear for a living right?! Here are a few tips for recognizing the hipster: they are making their gifts this year, wearing pants that are too tight, discussing the finer points of home brew, shopping for loudly printed vintage shirts, attending their bowling leagues (ironically of course), and drinking organic coffee from mugs (no paper cups). I love it. I designed this Hipster hat for the hipsters I know. It may look like a lot of purling, but it’s worked inside out to avoid that. The hat goes with the hipster code: don’t look like you’re working too hard on your look (but actually work REALLY hard to maintain your slightly dishevelled vibe). This hat looks a little inside-out with exposed seams to give it authentically ‘hipstery’ feel. You can knit this hat up for the little hipsters and the big ones alike, it has sizes from wee to great. 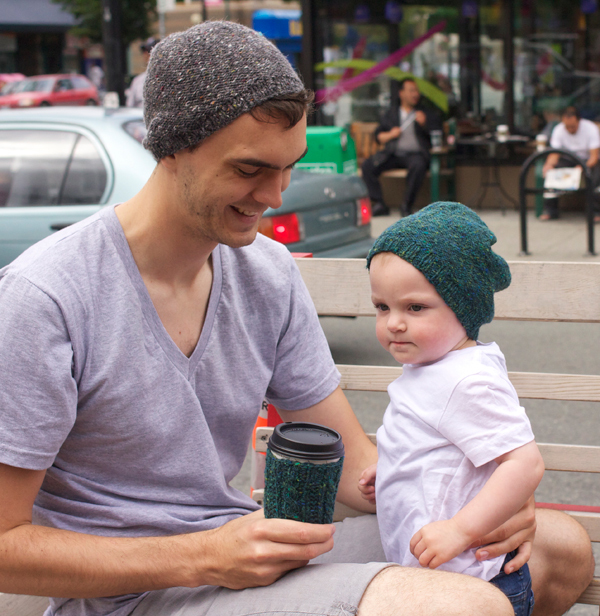 The hat is a most effective gift for the hipster mom or dad and child. They are not quite ready to give up their quirky lifestyle or their cool hobbies and stuff and having matching hats with your kid adds a distinctively ‘retro’ feel to your wardrobe. Have you created a family of knits? We LOVE pictures, so show us! Respond in the comments, or like our Facebook page and share your photos, it’s a great way to stay in touch. Oooohh and if you’re not yet in the know, Tin Can Knits is also on Instagram… with lots of knitting, and some hilarious shots of family too! Like our style? Be sure to sign up to get our email updates, so you don’t miss our new designs, excellent tutorials, and subscriber-only special offers!